Although lasers are widely used today for a variety of purposes, challenges related to their transmission of power remain largely unresolved. The power level delivered by a laser is limited by the medium—in many cases, air itself. For example, peak power can be limited by ionization in the air since ionized air disrupts and spreads the beam. Average power can be reduced by “thermal blooming,” which happens when the laser heats up and causes the beam to expand and lose power. 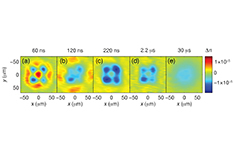 Ultrashort laser pulses provide a solution by creating their own lensing in the air, allowing pulses to travel long distances while staying in focus. However, the small amount of energy that can be tolerated by ultrashort lasers greatly limits their potential for yielding long-lasting waveguides in the atmosphere. Professor of Physics Howard Milchberg, Associate Research Scientist at the Institute for Research in Electronics and Applied Physics (IREAP) Jared Wahlstrand and graduate students Nihal Jhajj and Erich Rosenthal have developed a new technique for ultrashort laser pulses that involves modest energy to imprint long-lasting and robust waveguides in the atmosphere. These waveguides can persist for several milliseconds, extend for a kilometer or more, and resist thermal blooming to channel high power laser beams up to megawatt levels, far beyond what can be done today. Professor Milchberg explains that their development “of long-lived air waveguides simultaneously solves two longstanding, decades old problems: the delivery of high laser powers over long distances in the atmosphere, and the efficient collection of remote, weak optical signals.” The advantages of this type of waveguide include remote sensing, directed energy, the guiding of lightning, and standoff detection, which means that signals can be measured from a long distance away from their source and thereby provide information about the source’s properties. “We were quite pleased to be nominated, especially because it’s a testament to the idea that doing basic research and working on understanding the fundamentals can lead to breakthroughs with very practical implications,” he adds. In 2013, the Office of Technology Commercialization (OTC) received 154 invention disclosures from the university renowned faculty. Ten of these inventions were selected as finalists for the Invention of the Year Awards, based on their impact on science, society, and market potential. Winners will be announced on April 29, 2014 at the Celebration of Innovation and Partnerships event. About OTC: The University of Maryland created OTC in 1986 to provide expert guidance, support, and assistance in safeguarding intellectual property, encouraging research, facilitating technological transfer, and promoting collaborative research and development agreements with industrial sponsors. Visit their website for more information.